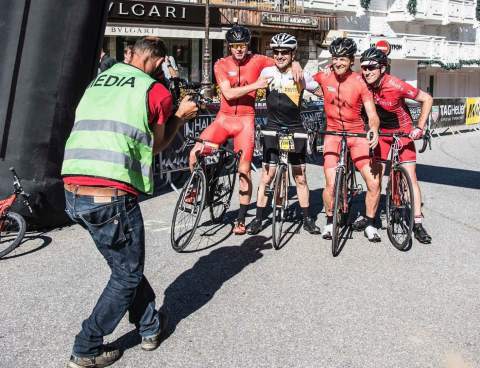 Feature from Ade at AlpCycles about who can ride and complete a Haute Route Event and lots of tips from the voice of experience! 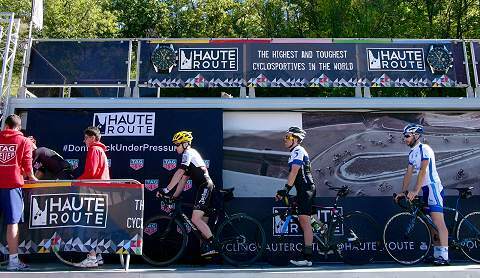 The Haute Route is a global series of multi-day cycling events for amateurs with seven timed and ranked stages and backed up by medical teams, mechanical support and rolling road security. Those competing in them will be tackling the highest, steepest, most-renowned terrain in world cycling and with each stage timed and ranked there is an overall ranking published at the end of each event. It’s a question that has prompted Ade to write this feature and put his experience around the event to good use. 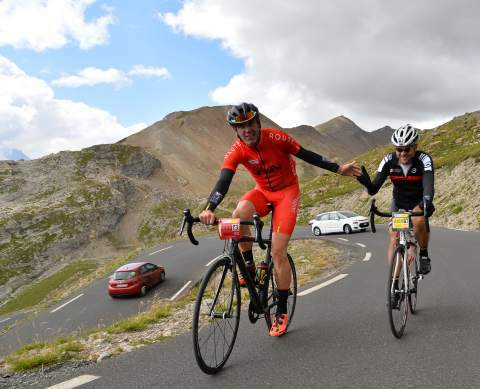 Ade writes “I am lucky enough to have ridden the Haute Route Alps as an individual rider, regularly taking our Alpcycles clients to the Haute Route events and am now employed by OCSport as the Lanterne Rouge (last man on the road) to encourage, support, annoy and generally boost morale of riders in the event! This gives me the fairly unique position of seeing the event from all angles: as a competitor riding for myself, as the Lanterne Rouge moving throughout the peleton from front to rear and as an Official Haute Route Tour Operator supporting our riders on and off the bike and with an understanding of all aspects of what makes a successful attempt at such a challenging event. 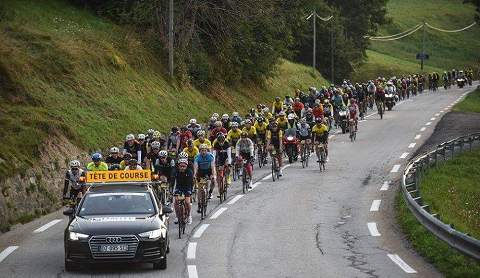 So, on the question of who can compete, in my opinion, anyone who puts the hours and commitment into their training on the bike can complete a Haute Route Event but you need to be realistic. If you don’t ride your bike for three months and turn up thinking you’ll scrape through and survive … think again! You DO need to put in base miles during your training and finding a pace that works for you and that you can maintain over long periods but you also need to set realistic training goals that fit with your work & home life and ensure you can sustain training. If you love to “watch the watts & numbers” do it but if you prefer some “just ride” days do whatever works for you. One of the hardest parts of the event is the overall tiredness that you will experience from riding seven big days back to back. The commitments of work, family and other areas of your life mean that “mere mortals” will rarely get the chance to add 5-7 hour stretches of time on the bike during your training schedule, let alone back to back days, and this is a good indication of the time you will spend in the saddle on each stage. • Before the event: Check your bike is in good working order, get it serviced and think about a new chain, cassette, new tyres and a fresh set of brake blocks. • Handling skills: Putting in all those hours of training to improve your climbing is great but remember you will need to fine tune your descending skills too! • Pace yourself: Haute Route Pyrenees, Alps and Dolomites are seven day events: think “a marathon not a sprint”. Keeping your pace under control on the first few days is key to your goal of completing the full 7 days. • Flat sections are best tackled in a group but avoid being dragged along in a group that is too fast for you as you will pay for it on the next climb. • It’s about the whole experience: It’s not all about your Watt meter. Make sure you look up once in a while and take in the breathtaking mountain scenery you will ride through daily. • Hydration: Sports powders and drinks aid you massively but beware that back to back days of heavy use can lead to stomach problems. Have two bottle cages and alternate with water (one bottle sports drink/one bottle water). • Nutrition: Similar problems occur with overuse of gels. Try to take in “real food” too! Use the feed stations that are on provided on the course. • Nerves: Don’t let your nerves get the better of you! It’s a huge challenge but just take one col at a time, one day at a time and before you know it the final finish line will be in sight. • Break up your riding position: Riding for hours on end in a seated position is going lead to back and bottom problems. You must alternate between standing and seated riding when climbing to alleviate the pressure to both these areas. Practice this in your training sessions too! • Time off the bike: As soon as you cross the finish line each day, the first thing on your mind needs to be rest and recuperation. Book your free massage, eat lunch, rehydrate and then get your feet up asap. So get to your hotel and chill before dinner. My final tip and quite literally about the “rear end”. When I was riding as Lanterne Rouge, one of the biggest problems for riders was the issue with saddle sores – the result of exceptionally long periods in the saddle, which can be excruciating and cause you to be unable to ride at all. Ensure you are using LOTS of chamois cream and invest in good WELL FITTED cycling shorts. Stick with a brand you know well and ideally have been worn a little prior to the event. Which ever event in the series you choose, the Haute Route is more than just a cycling event. It is also about embracing the camaraderie, the pain and the elation of competing over some of the toughest cycling terrain in the world. It’s a totally unique and unforgettable experience. Alpcycles.com is an Official Haute Route Tour Operator and runs accommodation & logistics packages that make life easier for our riders and ensure you can focus on your event and be fully supported by our team. As Lanterne Rouge for the Pyrenees, Alps, Alpe d’Huez and Ventoux 2017 I’ll see you on the road too!